Agilent Technologies has introduced a family of USB-based instruments designed for flexible configurations, quick setup, and affordability in electronic functional test and troubleshooting applications. The compact Agilent U2700A family includes oscilloscopes, function generator, source/measure unit and switch matrix in a versatile form factor that enables space-saving solutions. The feature of the U2700A family is its standalone/modular operation. Each device can be used as a standalone instrument, or mounted in a compatible chassis with other modules. In modular operations, the chassis enables synchronisation of all slotted modules through master/slave triggering capabilities, even across modules with different functions (excluding the switch matrix). Because modules can be easily added for future system expansion, start-up costs are low. "In today's challenging industrial and education markets, affordable value-added instruments provide a meaningful cost advantage," said Ee Huei-Sin, Vice President of Agilent's Basic Instruments Division. "Our family of USB-based modular instruments offers the flexibility to arrange and rearrange configurations to fit changing measurement needs -- easily, quickly and affordably." The bundled Agilent Modular Instruments Measurement Manager software provides user-friendly out-of-box configuration with its graphical interface and easily accessible functions, providing measurements without programming. Bundled IVI drivers allow users to program with Agilent VEE, C#, C++ and Microsoft Visual Basic, LabVIEW, if they wish. 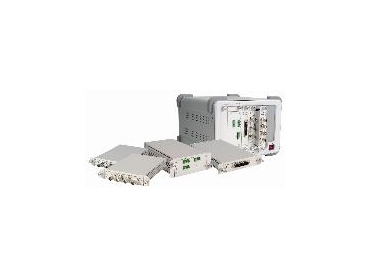 The Agilent U2700A USB modular instruments are available now.